ELEMENTARY: ALC offers a lower elementary program (grades 1-2) and an upper elementary program (grades 3-4) that meet on Tuesdays from 8:15 AM to 3:00 PM at Camp Sankanac. In addition to music, art, drama and physical education, the students pursue language and writing skills along with an inductive approach to science by way of group learning in a concrete/creative fashion designed to cultivate critical thinking skills. Printed materials and guided parental instruction will allow the ALC program and your home program to work in tandem. 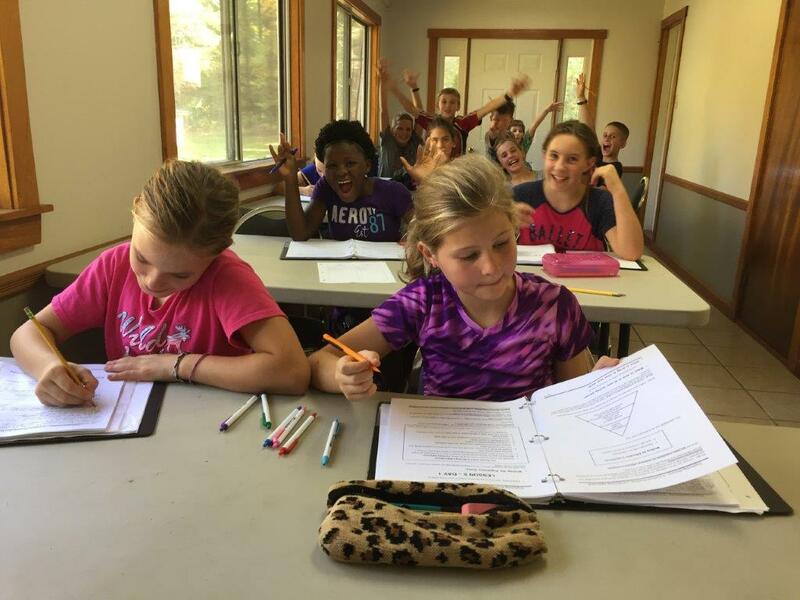 MIDDLE SCHOOL: ALC offers a lower middle school program (grades 5-6) and an upper middle school program (grades 7-8) that meet on Tuesdays from 8:15 AM to 3:15 PM at Camp Sankanac. Classes include Latin; an integrated approach to composition, speech, history and literature; lab science; music; art; drama; and physical education/sports. Academic classes are project oriented. The motivation and purpose that projects afford are coupled with an emphasis on acquiring critical thinking skills. Printed materials and guided parental instruction will allow the ALC program and your home program to work in tandem. HIGH SCHOOL: ALC offers a high school program (grades 9-12) that meets on Friday from 8:00 AM to 3:00 PM at Camp Sankanac. All 9th/10th graders must take rhetoric which focuses on academic writing, speaking and debate skills, history/literature (a four-year cycle through world history) and ALC’s science program (either physical science or biology in alternating years). All 11th/12th graders must take Christian Worldview which focuses on the content and skills necessary to view the totality of life from a Biblio-centric perspective and history/literature (a four-year cycle through world history). All other classes are on an elective basis. Electives include Spanish, chemistry, physics, advanced biology, speed reading, formal logic, choir, drama, and competitive sports. Printed materials and guided parental instruction will allow the ALC program and your home program to work in tandem. ​Grades 7-12: See PA homeschool law. Any of these required courses that have not been fulfilled in grades 7 or 8, must be taken sometime during grades 9-12. When entering Aleithia’s diploma program, evidence must be presented of any required course work that was completed prior to entering the program. arts and humanities - 2 years. All ALC students must take rhetoric in grades 9-10. Literature: Each year of high school, students must read a minimum of 25 books. Ten of the 25 must be books of the Bible; five must be considered classics; three must be related to history; 1 related to creationism vs. evolutionism; and three related to Christian theology and/or Christian worldview. Grammar: In 9th/10th grades, a recommended grammar program will accompany the rhetoric course. The 9th/10th grade student will also employ a self-editing process. In 11th/12th grades, the student will employ a self-editing process. Composition: Emphasis will be placed on writing structure and style. Each year, composition activities will be organized around writing forms. The Aleithia rhetoric and Christian worldview courses will provide the required types of academic and personal writing forms. Speech/Debate: Each student must deliver a minimum of one speech and participate in one debate per year. The Aleithia history/literature course will provide the required types of speech and debate. MATHEMATICS: No additional ALC requirements in this discipline. NATURAL SCIENCES: The studies of physical science, biology, chemistry, and physics must contain an element of inductive inquiry. All ALC students must take ALC’s physical science/biology courses in grades 9-10. SOCIAL SCIENCES: All ALC students must take ALC’s History/Literature Course in grades 9-12. ARTS AND HUMANITIES: All ALC students must take Christian Worldview in 11th and 12th grades. FOREIGN LANGUAGE: All ALC students must earn two years of credit in a foreign language (including American sign-language) of their choice during their high school tenure. ALC offers Spanish I and II as elective courses. ALC COMMUNITY PARTICIPATION REQUIREMENTS: To be eligible for an Aleithia diploma, students must participate in an Aleithia Learning Community for at least the last two years (11th and 12th grades) of their high school experience in which the students must take the two-year Christian Worldview Course. If a student completes a college level course: turn in transcript of grades earned. If a student completes a private class/tutoring: before the course begins, turn in course objectives and explanation of grading procedures from teacher; after course ends, turn in final grade report from teacher. If a student completes a class at home with the parent: before course begins, turn in course objectives and explanation of grading procedures; after course ends, turn in final grade report from parent.